LeTourneau Baseball Doubles Up Austin College 16-8. 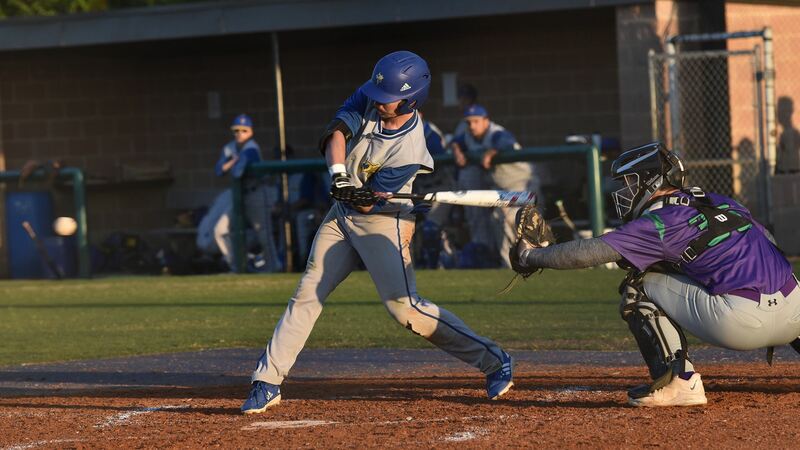 SHERMAN, Texas – Scoring 11 runs in the final two innings of play, the LeTourneau University baseball team would double up Austin College by a score of 16-8 at Baker Field in their 2019 non-conference finale on Tuesday, April 9. LETU improves to 18-13 overall while the Kangaroos fall to 7-18 overall on the season. Of the 24 runs scored in the game, 21 runs would be scored in the final four innings of action as the first three innings of the game would go scoreless. Only two runners would make it to third through the first three innings as AC would manage to break through for the first run of the game with a bases-loaded RBI single in the bottom of the fourth before leaving the bases loaded to end the inning. The YellowJackets would waste no time claiming their first lead of the game in the top of the fifth as a leadoff single would be brought around to score with a two-out rally as a walk, hit-by-pitch, and throwing the error with two outs allowed Lee Hosie and Will Bradshaw to score. LeTourneau would then tack on three runs in the top of the sixth as five of the first six batters of the inning would reach base with Brandon Ramirez delivering with a one-out two-RBI single to cap off the three-run spurt. Austin College would get two runs back in the bottom of the sixth on just a single hit as a hit batter, wild pitch, and balk allowed two runs to score to cut the YellowJacket lead down to 5-3. LETU would be retired in order in the top of the seventh to let the ‘Roos keep momentum and complete their rally by scoring four runs on three hits and one error as two walks to start the inning would prove costly. Down 7-5, LeTourneau would once again respond the inning after falling behind as the first seven batters of the inning would safely reach base to go along with three wild pitches and two stolen bases as LETU would send a total of 14 batters to the plate in a nine-run inning. The nine runs would come on just five hits and two errors, allowing the YellowJackets to take a commanding 14-7 lead. Things would settle down briefly in the bottom of the eighth as AC would be unable to get any type of offensive production going, allowing LeTourneau to come back up for their final at-bat of the evening where they would score two runs on RBI groundouts from Cody Lee and Kyle Guevara to go up 16-7. A leadoff double and throwing error would allow Austin College to push across one run in the bottom of the ninth, but a double play and fly out would end the game with the YellowJackets earning the eight-run win. A total of seven pitchers would be used in the contest by LeTourneau, with no pitcher tossing more than two innings or facing more than 11 batters. The final pitcher of the game for LeTourneau would be Tristan Wilson, improving to 1-1 overall on the year after tossing two innings and giving up one run on one hit and striking out two. LeTourneau will take on American Southwest Conference-leading Howard Payne University in a three-game series this weekend at Conrad-Vernon Field as part of homecoming and family weekend 2019. Due to the potential for inclement weather this weekend, an official determination on game times and dates will be made tomorrow morning and announced on www.letuathletics.com. The series opener is currently scheduled for Friday, April 12 at 7:00 pm with a 1:00 pm doubleheader on Saturday, April 13. LeTourneau Men’s Tennis Remains Perfect In ASC East, Wins 9-0 At Ozarks. CLARKSVILLE, Ark. 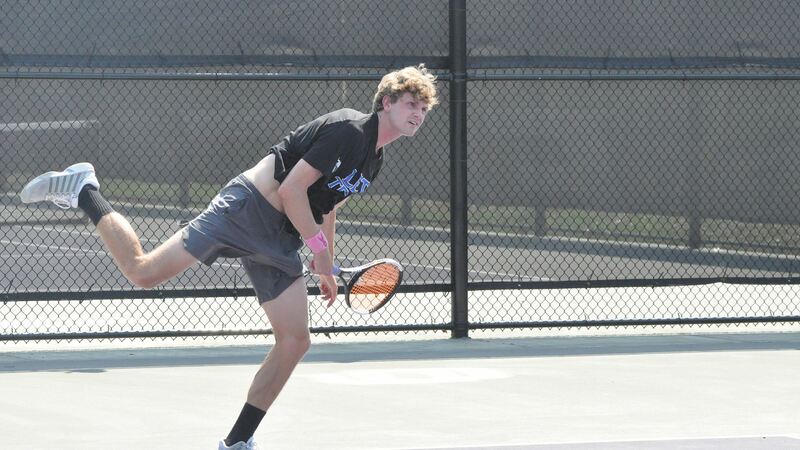 – Fresh off an 8-1-win last Wednesday over East Texas Baptist, the LeTourneau University men’s tennis team would put in a complete performance to down the University of the Ozarks by a score of 9-0 at the Alexander-Boreham Tennis Center in Clarksville, Arkansas on Tuesday, April 9. The win moves LETU to 10-6 overall and 3-0 in American Southwest Conference East Division play with one conference match remaining while the Eagles slipped to 5-9 overall and 1-1 in ASC play. Dominating play from the YellowJackets started in doubles action as Jimmie Henson, and Christian Farris earned an 8-3 win at number one doubles while Zac Crowley-Kurth and James Estrada picked up an 8-1 win at number two doubles. Completing the 3-0 sweep of doubles play would be Bobby Clark and Nathan Schmidt, as the duo would earn an 8-2 victory at number three doubles. Quick work would remain the theme of the match for LETU as none of the six singles events would be pushed to a third set as LeTourneau would win all six in straight sets to complete the 9-0 win. Henson would win 6-2, 7-5 at number one singles while Farris put together a 6-1, 6-4 victory at number two singles to clinch the match for the YellowJackets. In the number three singles match, Crowley-Kurth would earn a 6-3, 6-1 victory while Schmidt would drop a total of three games in a 6-3, 6-0 win at number four singles. Seeing his only action of the day at number five singles would be Paulo Cressio with a 6-1, 6-2 win to go along with a 6-1, 6-0 win from Clark at number six singles. A chance to close out ASC East Division play undefeated is on the line for LeTourneau when they travel to Pineville, Louisiana to take on Louisiana College at 1:00 p.m. With a win, LETU would earn the right to host the 2019 American Southwest Conference Men’s Tennis Tournament which will take place April 25-27. Louisiana College is currently 2-7 overall and 0-3 in ASC matches. CLARKSVILLE, Ark. 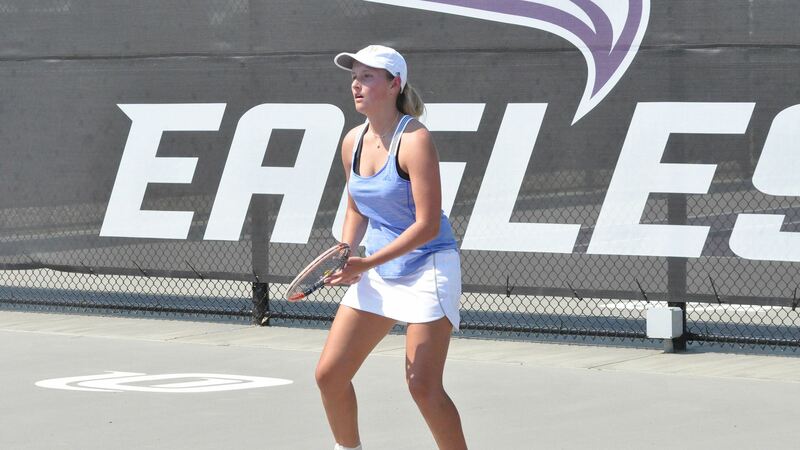 – Looking to start the week off strong in the first of four scheduled matches, the LeTourneau University women’s tennis team earned a 6-3 road win over the University of the Ozarks at the Alexander-Boreham Tennis Center in Clarksville, Arkansas on Wednesday, April 9. Earning their second American Southwest Conference win of the season, LETU improved to 7-8 overall with the victory and 2-1 in ASC East Division play while the Eagles fell to 6-7 overall and 1-1 in ASC play. In doubles action, the YellowJackets would get out to two quick points with wins from Katharine Waldthausen and Maddison Brackenreg at number one doubles (8-1) and Terin Murray and Gracie Favela at number two doubles (8-2). Ozarks would claim the other doubles point at number three doubles as Lauren Rockwell and Samantha Trevino would be unable to pull out a victory in an 8-2 loss. It would be the top of the singles lineup that would come through strong for LeTourneau as Waldthausen blanked her opponent at number one singles in a 6-0, 6-0 win while Favela won at number two singles 6-2, 6-0. Murray would clinch the match with a 6-1, 6-2 win at number three singles while Mimi Samdi won by scores of 6-2, 6-3 at number six singles. The other two singles matches would see the Eagles spoil things for the YellowJackets as Rockwell fell 6-3, 6-4 at number four singles and Trevino fell 6-1, 7-5 at number five singles. More conference action awaits LETU as the YellowJackets will travel to Pineville, Louisiana to take on Louisiana College at 1:00 p.m. on Friday, April 12. The match will serve as the final conference match of the season for LeTourneau. 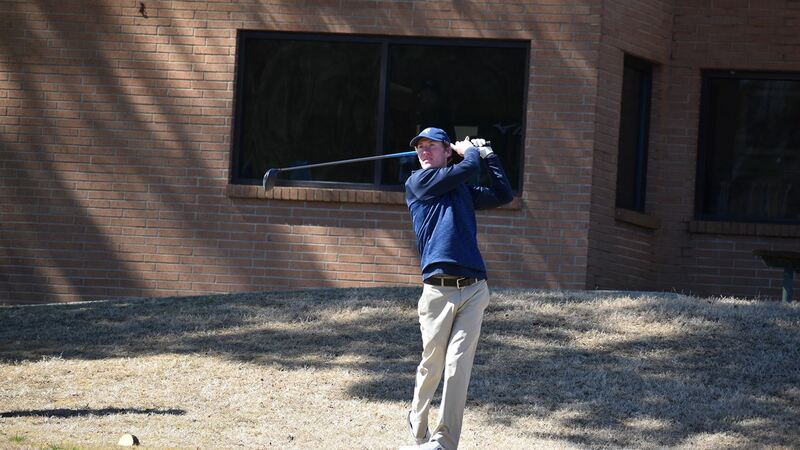 LeTourneau Men’s Golf Takes Fifth At ASC Championship Preview Meet. KERRVILLE, Texas – Previewing the site of this month’s American Southwest Conference Championships, the LeTourneau University men’s golf team would make a final-round push to take fifth place at the 12-team ASC Championship Preview Meet held at Comanche Trace Golf Club in Kerrville, Texas on Monday, April 8. The one-day, 36-hole meet would see the YellowJackets bounce back from an opening-round 304 to post a final-round 297 and finish with a score of 601, just one shot back of Hardin-Simmons in fourth-place. Winning the meet would be Concordia University Texas after completing with a team total of one-over 577 after rounds of 289 and 288 while Southwestern University (583) and McMurry University (588) rounded out the top-three. Despite being a conference championship preview meet, Southwestern University, Texas Lutheran, and Schreiner University would also take part in the meet. LETU’s top finisher of the tournament would be junior Cory Gillespie who would make a 13-spot improvement after an opening round 75 to shoot a two-under 70 on his final round to finish tied for fifth with a total of 145. Gillespie’s final series would feature four birdies including three on the back nine to go along with just two bogey’s to shoot the third lowest round of the tournament. Shooting rounds of 75-74 to finish in a tie for 16th would be Wes Nolen after a total of 149 as the freshman would put up three birdies in his final round. Two shots back of Nolen would be Buster Byrnes with rounds of 76-75 to finish with a total of 151 in a tie for 23rd while Reed Fisher would end in a tie for 27th with rounds of 73-79 playing as an individualist. The YellowJackets would also get 36-hole totals of 157 from Alex Koll (79-78), and Dalton Northcutt (78-79) as the two would finish in a four-way tie for 52nd on the 6,988 Yard, Par-72 course. Before turning their full attention towards the ASC Championships, LeTourneau will get one more tuneup at the Rhodes College Spring Collegiate Classic which will be hosted in Germantown, Tennessee beginning on Monday, April 16th. The 54-hole meet will be held at Windyke Country Club and will feature a mix of teams that LETU does not typically face in their regular-season schedule.